Drive faithfully recreated farming vehicles from such industry leaders as Zetor, Landini, McCormick, Gregoire, DAF, Mitsubishi, and many more. Reproduced down to the smallest detail, including their weight and physics, the machines will offer a realistic, in-depth experience of running a modern farm. Travel between your farms located in Italy, Colombia, Japan and Montana, USA. Grow unique region-specific crops and use dedicated machines never before seen in farming simulators, including the rice planter, hemp harvester and more. 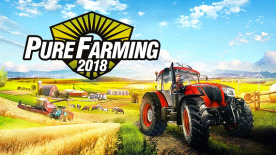 Enjoy the freedom and challenge of running your own farm in Free Farming, learn the ins and outs of agriculture in My First Farm, or test your farming skills in objective-focused Farming Challenges.